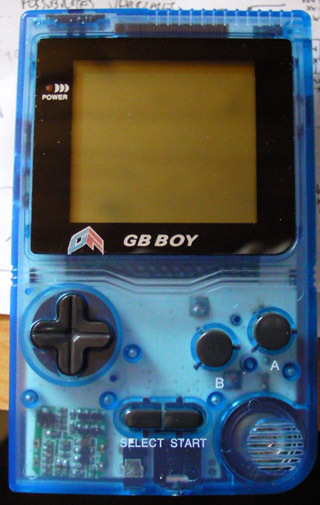 This page is about the quite recent and unique Chinese GameBoy Pocket clone called "GB BOY". 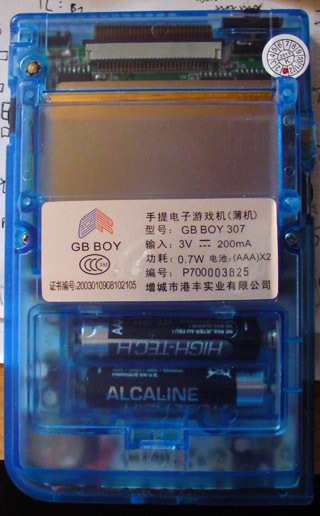 A GameBoy Color version exists called "GB BOY COLOUR" (sic). The brand is "GangFeng" (also randomly transliterated to "GongFeng" or "KangFeng"). I didn't find the real name of the manufacturer. 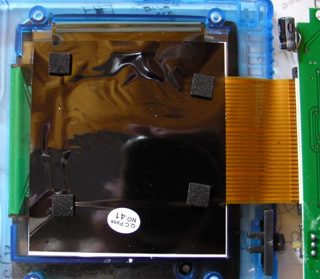 The shell is held together by 3.8mm "game bit" and regular philips screws in locations similar to those on the real GameBoy pocket. Power requirements are also close to those of the real GameBoy Pocket. This one was apparently made in January 2013. That's actually a tamper-proof "crumbly" sticker covering one of the screws. 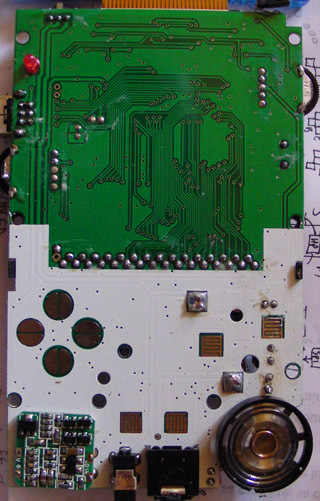 For some reason, the designers also copied the original GameBoy's self-oscillating DC-DC voltage converter board. 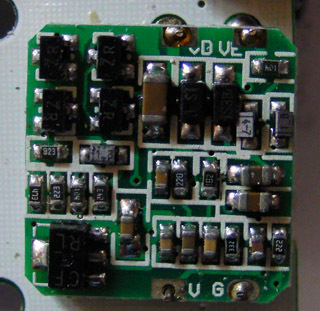 It provides 5V for logic and 20V for the LCD from the batteries ~3V supply. The coil is on the back. 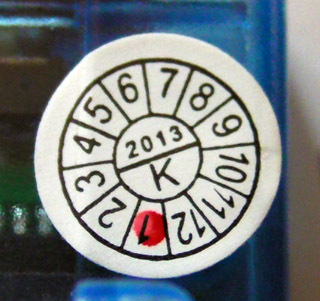 In traditional bootleg Chinese style, the main ASIC is stamp-marked ("KF" for KangFeng ?) but doesn't seem to have been sanded down. 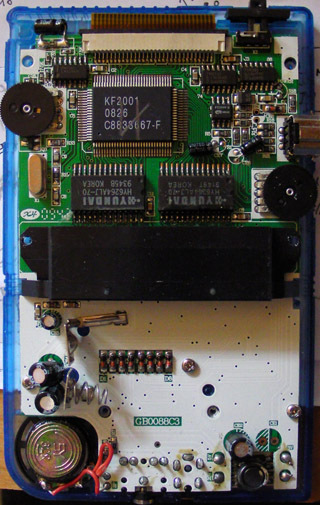 It runs on a 5.000MHz crystal, which is quite far off the original 4.194304MHz. It's unlikely to be PLL adjusted, maybe the frequency increase is needed to compensate for inaccurate video logic or display quirks. The odd mix of semiconductor brands could make one think they're just using whatever chips are available before they're starting to rot. Two classic 6264 8KB SRAM chips make up the work RAM and VRAM. Hyundai is a Korean brand and the oldest chip is from 1991 ! The LM324 is from National, the two logic chips are from NXP. The headphone amp is a Princeton PT2308, a fabless Taiwanese company. 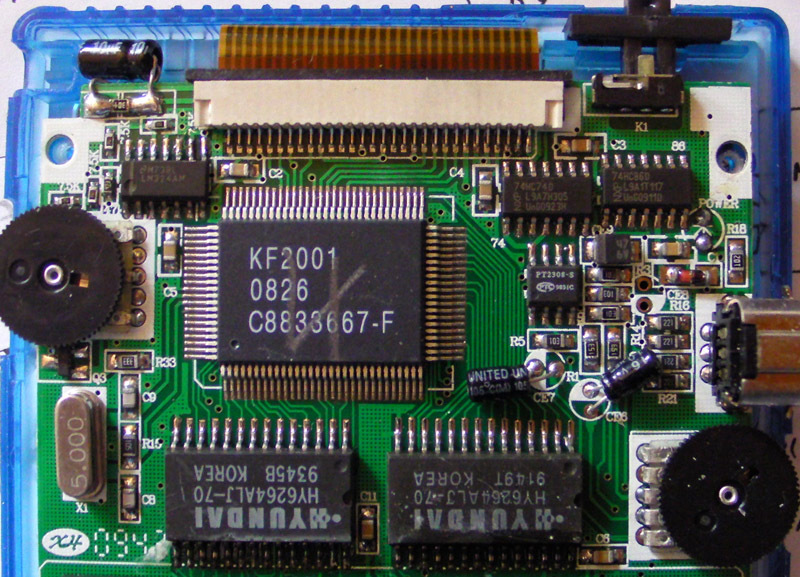 The PCB layout is ugly but not that crazy. Note the "X4" logo and lot code next to the crystal. The silkscreen font and grid copper fills reminds me of the Watara Supervision. Smells like Hong-Kong. The row of diodes for the inputs is cute.